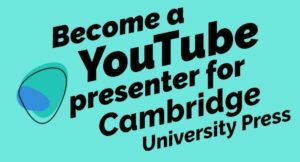 Cambridge University Press has launched a global competition to find four presenters for its new YouTube channel. The channel – ‘Learn English with Cambridge’- will support English language learners by teaching them how to use English in the real world. Rupert Daniels, Global Marketing Director at Cambridge University Press, said: “From new words and popular phrases, to how to prepare for an interview, or how to order something in a restaurant, we want our channel to offer fun, informativeand practical language advice to show how people can use English in the real world. · a monthly fee for their production and presentation services.